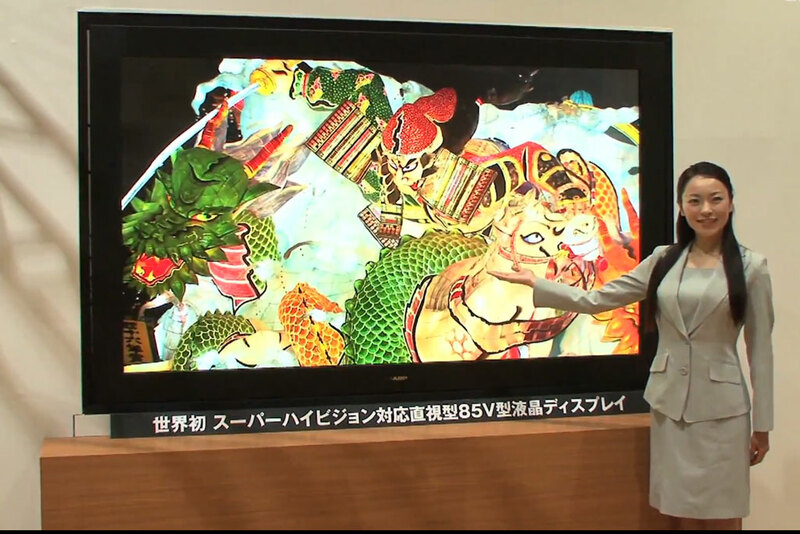 Japan Broadcasting Corporation (also known as NHK) together with Sharp Corporation have jointly developed an Super Hi-Vision 85-inch LCD – a next-generation television broadcast format. This is a world first for a direct-view display. NHK initiated the research of the Super Hi-Vision technology – a dramatically higher resolution than current HDTVs back in 1995 with the aim of stating trial broadcasts in Japan in 2020. With approximately 33 megapixels (or 7,680 pixels [H] x 4,320 [V] pixels), the new LCD has 16 times the resolution of conventional HDTV. Developing the technology will have to consider three major elements: the display itself (which will be shown to the public at NHK’s Science & Technology Research Laboratories in Tokyo from May 26 to 29, 2011); content – which will need to be created specifically to benefit from this technology. Creating 33 Mega Pixel content can only be done using computer rendering. New methods and hardware will need to be developed including special video cameras capable of delivering this kind of resolution. Finally ultra high speed connections will be required to transfer the huge amounts of information required to allow the LCD to display the content (its possible that new storage devices will also be required). It is clear that although the new display is a magnificent achievement in terms of the clarity and detail level it can display, there will be many more years before most of us will be able to use similar technologies in our homes. You can watch a short video demonstration of the new Sharp display and its eye catching content on the following Youtube video. TFOT covered several high resolution display technologies including high res displays from Samsung and Toshiba, Barco 6 MegaPixels Display as well as the innovative Heliodisplay Floating Display. Eurocopter X3 – Fastest Helicopter on the Planet?